Do you suddenly want to sew all the floral prints up come springtime? I do! 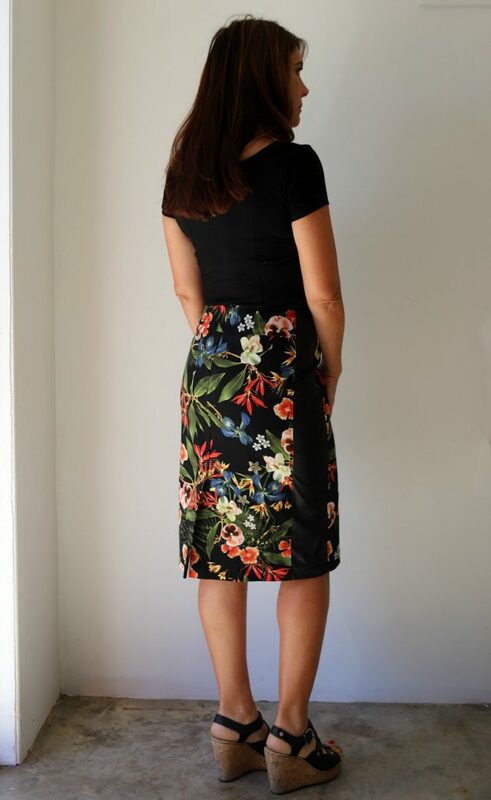 This is my second version of the Liesl & Co Extra Sharp Pencil Skirt. This version is in a stretch cotton woven I picked up at Joann recently, with faux leather panels from my stash. I made the skirt in a size 4 with no adjustments. It’s a simple sew, especially the second time. 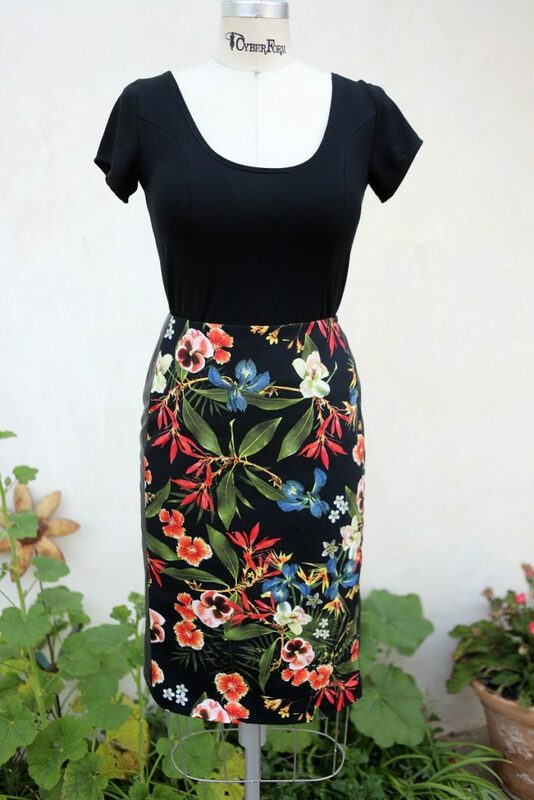 I wanted a fitted black T shirt to wear tucked in with it, so I decided to cut the princess lined Jalie Bella dress into a top. It was super easy since the pattern is already divided into a top and bottom half. I just traced the top part. I never see princess lined T shirts in stores, and they give a nice shape. I apologize that the princess seams are hard to see in this black fabric. I found this knit fabric downtown for a dollar a yard. It must a be a rayon lycra as it does get wrinkly and needs to be ironed. Honestly, I prefer pain old cotton lycra to these types of synthetic knits that have become so common. But what do you want for a buck a yard? Do any of you over forty remember those Betsy Johnson tops and dresses from the 80’s and 90’s? I used to shop at the Betsey Johnson store in Hollywood on Melrose as a teen. It was quite expensive, as it was all made here in the Good Old USA, but there was a little basket in back where treasures could be found for ten dollars each. I spent my waitressing money many times there! The cotton lycra was so nice. They don’t make fabric like they used to! But I digress. I made the top in a size V. I originally made the T but it was skin tight. Jalie patterns tend to be really fitted, or actually true to size, and I tend to be unrealistic about what size I should cut! I think I may add a half circle skirt to this top pattern to create a simple summer dress. The Jalie Bella is a great dress, I’ve made it for the girls, but it looks like it may cling too much in all the wrong palces for me. I think having a waist seam with a circle skirt will be a cute basic style for a summer dress. What do you think? Extra Sharp Pencil Skirt In Denim Jalie Bella: The perfect teen party dress Jalie Bella in crushed stretch velour. 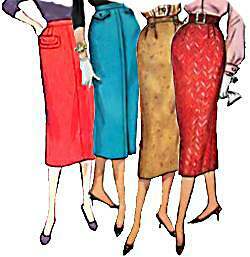 Announcing My Pencil Skirt Drafting and Sew-a- long. Did you raise the neckline in the back of the T? It looks higher than in the pattern line drawing & photos. Thanks! No, I switched it around and am wearing the back in the front. It actually fits my bust better that way, and the sleeve is symmetrical so it doesn’t seem to make a difference. What a great idea for the Bella! I made a dress for my trip to Rome last year and I cut it 2” past my knee as I read “no knees” at the Vatican (but the dress code rules apparently are not followed anymore at least not that I could see). I think I may cut my dress apart and create a top and skirt and that way I can short the skirt from a he top and still have the twirl factor. And I’m definitely making a T-shirt from the Bella. Love it all! I can’t wait to see the dress with the circle skirt. I have never seen princess seams in a t-shirt before, but they certainly give it a nice fit and a tailored look! Love your new outfit. My sister draped a princess seam t-shirt for me, so now most of my t-shirts are princess seam. I love them and they fit so much better. 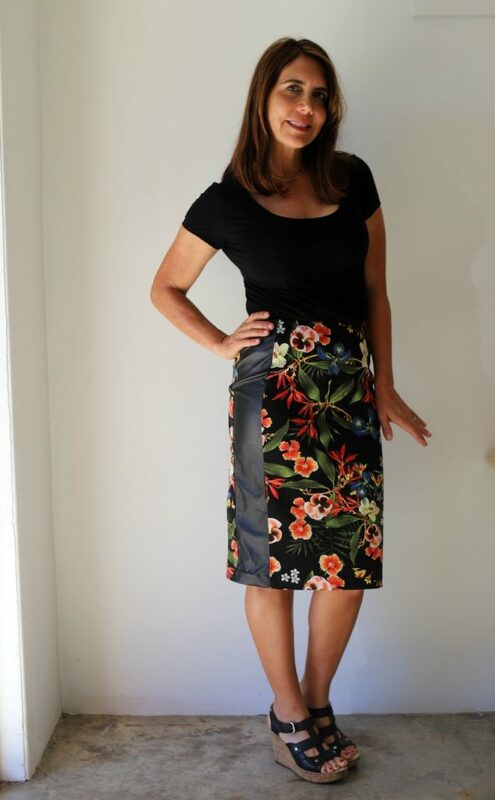 I really like the faux leather on the skirt, what a great idea and super slimming. I love princess seams. I’ve never seen them in a a tee shirt, either. Your last picture really captures the seam and boy, do I like it! What a great idea. Your skirt is beautiful. I especially like the faux leather panels – they really kick it up a notch. Great outfit, Justine!